While coupons internationally are already well established as a promotional instrument, couponing is a comparatively new promotional tool in Germany. Depending on the configuration, it may help advertisers effectively with customer loyalty and customer acquisition. These coupons are primarily used for promotion and to maximize sales. But their value is not limited to just that, as other marketing objectives can be achieved with coupons, too. Marketing objectives like customer loyalty, acquisition of new customers, and the increase of the so-called Customer Lifetime Value all can be supported with coupons. Direct-Mail-Coupons: These coupons are sent along with a personally addressed direct mail. Including coupons in a direct mail campaign makes the receiver feel valued, and can significantly strengthen customer loyalty. Electronic Coupons: These coupons are sent by e-mail or e-mail newsletter directly to the customer. Using email gives immediate access to the customer, but the customer must give their approval to receive your email. Mobile Coupons: The distribution is done through mobile phones via SMS. These coupons also require the recipient’s consent. The main target group of this mobile coupons is among the under 35-year-old. Although marketers are using more the digital coupons, print coupons are still the most widely used form of voucher. This is also evidenced by the mobile couponing study of E-Commerce Center. Of the two thirds of consumers who have redeemed coupons, 87% use print coupons. Coupons that can be downloaded from the Internet follow with 71 percent. Mobile coupons, however, were previously used only by 14 percent. 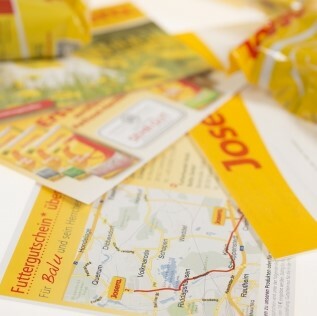 Pet food manufacturer Josera successfully implements vouchers in their direct mail campaign. Together with personalized maps from locr the ongoing campaign sustainably generates successful results. Ready to create an incentive direct mail campaign?